Looking to buy a new or second user laptop or desktop computers? Do you require specific specs, or are you unsure of what you require and are just seeking a little advice? We are always happy to assist you, so feel free to ask away whilst you browse in store or online. Many of us worry about how much laptop or desktop repairs will cost us. We suffer with broken screens, slow-running systems, constant crashes and malware attacks until the laptop becomes all but unusable. We offer a range of services to suit everybody’s needs at affordable prices. Virus’ and Spyware are a major concern, and making sure that your computer is safe is an absolute necessity. We can perform full virus sweeps to make sure all infected files have been removed and to correct any registries or other options which may have been altered due to the infection. 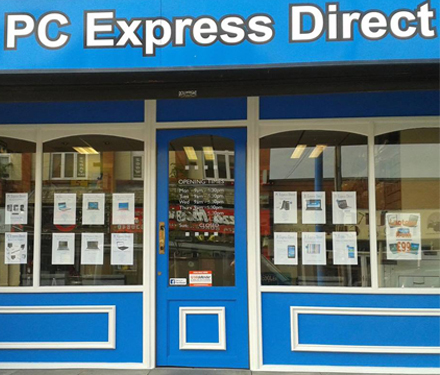 PC Express Direct has been trading in Queensferry for over 10 years, offering a friendly and personal service to our customers. We started out in August 2005 in a smaller premises a few doors away from our current location. The business grew, and with a need for more space, we moved to 33 Station Road in April 2008. We now offer a wide range of services in store to our customers, from offering new and refurbished computers to bringing old or dead machines back to life. As a business we pride ourselves on offering services to all of our customers that are both top notch and affordable, ensuring that each and every person who comes into store leaves completely satisfied with our work. 5 star service. The advice and the aftersales service from Dennis is just never ending. I purchased my Dell laptop from this shop and totally happy with the service. Very highly recommended. You came to my rescue & saved my PC! Now I can dedicate more time to my blog and make a proper go of it! Can’t thank you enough! You are a star.